This adorable complete Bambino Cuddle kit includes 5 pre-cut strips, pattern, backing, and binding. Measuring at about 28" x 41". 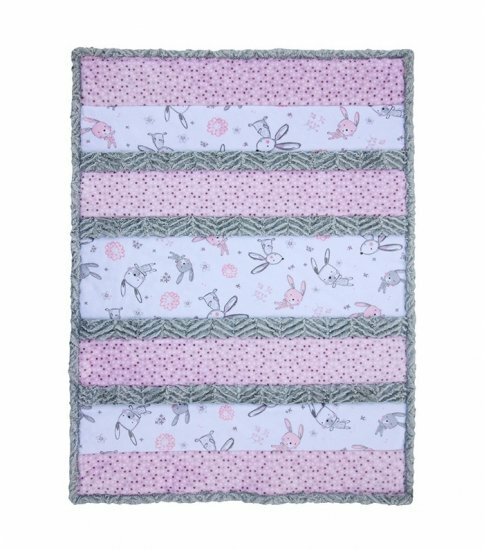 Quilt front fabric is Bunny Hop Cuddle Blush, Dottie Dot Cuddle Blush, Luxe Cuddle Ziggy Silver. Binding is Luxe Cuddle Ziggy Silver. Backing is Bunny Hop Cuddle Blush.